On Thursday March 21, SyncShow Interactive had the pleasure of attending one of this year’s most talked about events, TEDxCLE. It was a day filled with local and regional speakers sparking deep discussion through their innovative ideas. If you’ve never heard of TED, it is an annual event started in 1984 where some of the world’s leading thinkers and doers are invited to share what they are most passionate about. “TED” stands for technology, entertainment, design – which are three important subject areas shaping our future. The TEDx events are local and self-organized, with the TEDxCLE event organized by Clevelanders Hallie Bram and Eric Kogelschatz. You can learn more about the history of TED and the TEDx program by checking out the TEDxCLE website. This year’s event showcased a diverse group of speakers, 14 in all, plus a TEDtalks video recording of Lee Fisher’s speech from TEDxDesMoines (You can watch the talk here, it was super impactful!). There were several speakers who focused on the expansion and development of Cleveland, including Joy Roller, President of Global Cleveland. Mansfield Frazier, who is currently the executive director of Neighborhood Solutions, Inc. spoke about how his organization established country’s first inner-city vineyard, right in the heart of Cleveland, and future reimaging ideas for the city. The executive director of St Clair Superior Development Corporation, Michael Fleming, focused his speech on urban development in the St Clair Superior neighborhood. He coins it the “next” neighborhood, with innovations such as the Urban Grazing Program, the Cleveland Flea, Urban Upcycle and Kurentovanje Cleveland. Felton Thomas, director of the Cleveland Public Library, motivated everyone in the audience to “be the drum major in your own lives” while promoting all of the current and future offerings from the CPL. Michael Pultz’s ingenious Lottery League project puts local musicians from various genres together into 4 piece bands to expand music horizons. The event couldn’t have ended in a better fashion than with a glow-stick raving dance party from the speakers of Thrive Cleveland, Scott Simon & Jen Margolis, who just wanted everyone to get happy – for themselves and for their city! 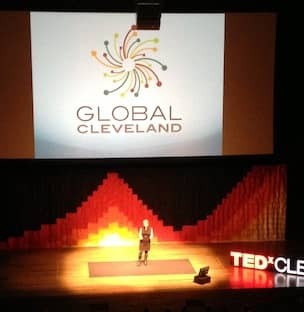 TEDxCLE included several more intriguing speakers and the event was an overall success, with many stating this year's event was even better than last year. With so much creativity and positivity focused around the city that we love, it was an inspiration to us at SyncShow.